IDC has just released their tablet market estimates and their figures are quite a bit off from my original Q1 estimate, but eerily similar to my revised estimate based on NPD's figures. Android tablets seem to have permanently stolen the tablet market crown from the iPad, while Windows tablets have continued to struggle. Let's take a deeper look at the figures. 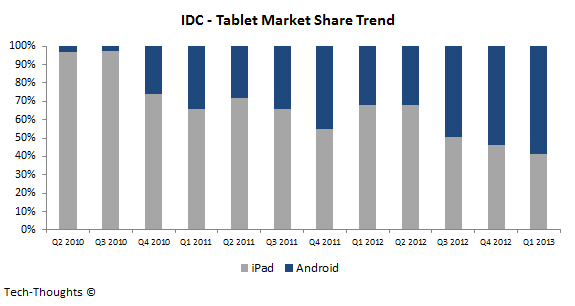 Android now leads the tablet market, with a share of 56.5%, while the iPad's share has fallen below 40%. Windows tablets are still struggling, with a share below 4% and with struggling shipment figures, sell-through is always questionable. 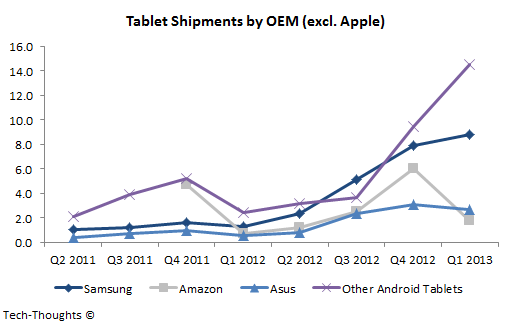 As the chart above shows, Android tablets have made convincing gains over the iPad in the last couple of quarters. This growth is really impressive considering the fact that it occurred in the midst of Apple's hyped iPad Mini launch. This leadership shift is not unlike the one we saw in the smartphone market, which occurred around the timeframe of Apple's iPhone 4 launch. Apart from the leadership change, the most important takeaway from the chart is that Android tablets did not see a sequential decline in Q1. I had earlier stated that seasonality in tablet demand (especially for Android tablets) would reduce as emerging market demand grows. Based on the figures, I would say that demand for tablets in emerging markets has seen an explosion - This is very good news for low cost tablet vendors, but not necessarily good news for Apple, Microsoft and the PC industry. 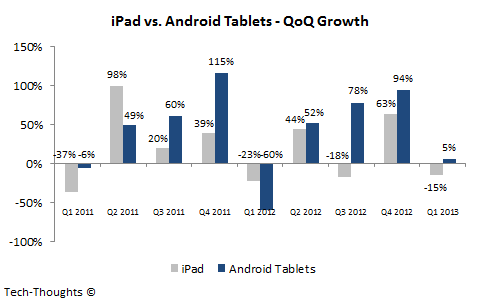 As I had previously shown, the growth of Android tablets in Q4 2012 was far more broad based than it was in Q4 2011. Among leading Android OEMs, Samsung has seen strong sequential gains, Asus has maintained its position and Amazon's tablet shipments have seen a sharp seasonal fall (sharper than I expected). But the big story here is the performance of "Other Android Tablets" - These mid-range to low-end tablet vendors are mostly regional players, but will make more of a mark as we move forward. The Android platform has enabled these vendors to come out with products "good enough" for the masses at very low price points. This will be a major factor in slowing shipments of PCs and Windows 8/RT tablets over the next few years. 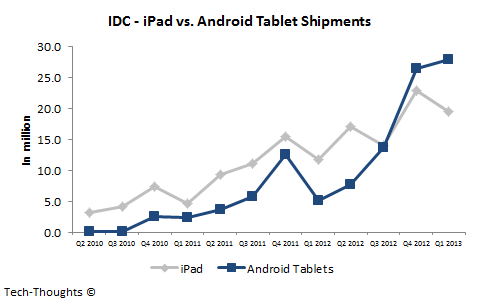 Looking at the chart above, iPad shipments normally see strong growth in calendar Q2. However, this is always driven by a new product launch. Tim Cook's comments during Apple's earnings call suggest that any new products will only be launched in the fall, making Q4 the first full quarter after a new iPad/iPad Mini launch. This means that iPad shipments should see another sequential decline in Q2 (to ~17-18 million). This dynamic, combined with exploding emerging market demand for Android tablets, is likely to push Android's market share above 60% (with shipments above 30 million). This would essentially be a repeat of the iPhone vs. Android battle we saw in the smartphone market, over the past couple of years. That is certainly true today. But as products continue to improve, that may not necessarily remain true. I believe the first step towards the next tier of the market will happen when we see cheap Android hybrid tablets on the market. That could happen as soon as this year. It won't necessarily need a 'hybrid' as such. The incorporation of the Motorola 'Webtop' technology into generic Android will facilitate 'work' via Chrome (and its associated Apps) which will only improve over time. Miracast wireless connectivity to a TV/monitor is already supported, and if you add Bluetooth keyboards and mice your away! That's a definite possibility as well. That could very well be the way Google implements the android-chrome merger.